"I do not support the Water Fix as currently configured. Meaning, I do not support the twin tunnels. But we can build on the important work that’s already been done. That’s why I do support a single tunnel. "The status quo is not an option. We need to protect our water supply from earthquakes and rising sea levels, preserve delta fisheries, and meet the needs of cities and farms." Conveyance and efficiency. And recycling projects like we’re seeing in Southern California’s Met Water District, expanding floodplains in the Central Valley, groundwater recharge, like farmers are doing in Fresno County. We need a portfolio approach to building water infrastructure and meeting long-term demand. To help bring this balance, I’m appointing a new chair of the California water board, Joaquin Esquivel. Our first task is to cross the finish line on real agreements to save the Sacramento-San Joaquin Bay Delta." 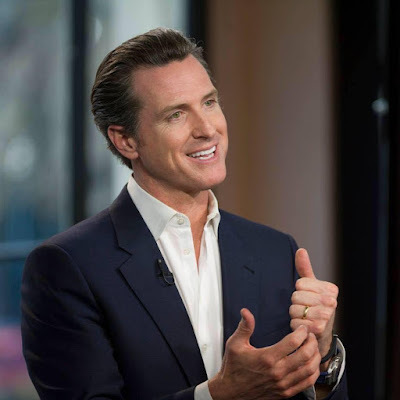 In addition, Newsom called for solving California's clean drinking water crisis in poorer communities. Now, let’s talk honestly about clean drinking water. Just this morning, more than a million Californians woke up without clean water to bathe in or drink. Some schools have shut down drinking fountains due to contamination. Some poorer communities, like those I visited recently in Stanislaus County, are paying more for undrinkable water than Beverly Hills pays for its pristine water. This is a moral disgrace and a medical emergency. There are literally hundreds of water systems across the state contaminated by lead, arsenic, or uranium. Solving this crisis demands sustained funding. It demands political will. "We look forward to working with his administration and the State Water Resources Control Board to create and enforce policies that will restore Delta water quality and quantity, lessen water dependence on the Delta, and promote clean drinking programs and regional self-sufficiency for the benefit of all Californians. Assemblymember Jim Frazier (D-Discovery Bay), whose district encompasses a large portion of the Delta, issued the following statement today after Gov. Gavin Newsom said in his State of the State address he does not support the twin tunnels project, calling this a “step in the right direction." As I receive more responses to Newsom’s statement, I will post them here. “We also need a fresh approach when it comes to meeting California’s massive water challenges. We have a big state with diverse water needs. Cities that need clean water to drink, farms that need irrigation to keep feeding the world, fragile ecosystems that must be protected. I do not support the Water Fix as currently configured. Meaning, I do not support the twin tunnels. But we can build on the important work that’s already been done. That’s why I do support a single tunnel. We need to protect our water supply from earthquakes and rising sea levels, preserve delta fisheries, and meet the needs of cities and farms. Our first task is to cross the finish line on real agreements to save the Sacramento-San Joaquin Bay Delta. We must get this done – for the resilience of our mighty rivers, the stability of our agriculture sector, and the millions who depend on this water every day.